During the Cold War, the United States and the Soviet Union sat for years with thousands of nuclear weapons pointed at each other. The reason the Cold War stayed cold was that these warheads created a state of mutually assured destruction between the two super powers. Mutual assured destruction, or mutually assured destruction (MAD), is a doctrine of military strategy and national security policy in which a full-scale use of high-yield weapons of mass destruction by two or more opposing sides would cause the complete annihilation of both the attacker and the defender. It is based on the theory of deterrence where the threat of using strong weapons against the enemy prevents the enemy's use of those same weapons. As the clock ticks down on the North Carolina US Senate race, the campaigns of Democrat Kay Hagan and Republican Thom Tillis seem to have settled into a similar faceoff. For an race that could decide control of the Senate during the last two years of the Obama presidency, the race has remained decidedly timid. Even with each side given opportunities to go on the attack over the past week, both sides have remained gun-shy. First, at the beginning of last week this story broke on WCNC about fishy sounding connections between donations to the Thom Tillis campaign from folks who could benefit from the I-77 HOT Lanes project - a project that Thom Tillis long supported. It's a 6 minute segment - an eternity for local news. It also starts with something all but unprecedented. WCNC reporter, Stuart Watson says right up front in the video that he got the tip for the story from "opposition research" - or in other words the Hagan campaign. Usually, reporters protect their sources. Usually, a source like this would demand anonymity. In this case however, the source wanted the Tillis campaign to know exactly where it originated. This story didn't come from a single underpaid and overworked reporter at WCNC. It originated from an organization with millions of dollars at its disposal and the single-minded purpose of beating Thom Tillis - an organization with the means and motivation to find more dirt if necessary. The story was a deterrent. By the end of last week it became clear why it was needed. On Thursday, Politico broke this story about Kay Hagan's husband owning a company that directly benefited from some economic stimulus funds - $390,000 to be exact. The story is bad, really bad. That's evidenced by some more details added by the Washington Post the next day which show the Hagan team has brought in a fixer with connections all the way to the White House to help manage it. Both of these stories could have attack adds that all but right themselves. In both cases, if either contender was not afraid of their opponent's potential response, either of these stories could deal a knockout blow. So far though, neither campaign has flooded the airwaves with commercials using these story lines. The hard hitting commercials, the nuclear weapons of major political campaigns, have remained in their silos. Without those commercials the only people who know about these stories are the political junkies and the partisans. So, why have they remained silent? Mutually Assured Destruction based on the whiff of corruption. Don't expose mine or I'll destroy you with yours is the message. However, unlike during the Cold War where M.A.D ensured there was no winner or loser, in November one of these two candidates will be the next US Senator from North Carolina. Tillis Campaign at the Tipping Point? Back in July, we wrote about the NCSEN race possibly being off the critical path in the contest for a Republican majority in the US Senate. National pundit Larry Sabato had said as much in his Crystal Ball newsletter when he failed to list North Carolina in his listing of the 6 most likely Republican pickups. Much of Sabato's analysis had to do with the widening of the playing field to include Iowa. State Senator Joni Earnst had made that an unexpected possibility for the GOP by running a spirited campaign as a conservative in that state's primary and winning handilly. Over the last two months things have not improved for Team Tillis here in North Carolina and only gotten better for Team Earnst in Iowa. A look at the recent polls for the two races at RealClearPolitics.com tells the whole story. Tillis's numbers have been going the wrong way and Earnst is definitely gaining momentum. This past week Sabato actually moved NC to leans Democrat. The one thing that can turn this type of situation around is money and apparently that is now in short supply as well. If you are on Republican email lists, you have no doubt recently received the panicky emails from the NRSC begging for money. How may of those emails do you think received responses like #remebermississippi? How much money has the NRSC's and Karl Rove's war conservatives this election cycle cost the party and individual candidates? The number has to be in the many millions of dollars. So now, the NRSC and it's establishment allies are facing a choice. They can pour more money from their limited resources into a state like North Carolina in the hopes they can buy the general election for Thom Tillis like they did the Republican primary here, or they can use those limited resources to support a candidate like Earnst in Iowa - the type of candidate they have spent this whole election cycle trying to beat. There is much to think about in the poetic justice of that choice. Things are beginning to get downright weird on the road to signing the final-final-we-really-mean-it -this-time contract with Cintra on the I77 HOT Lanes project. We're not sure if this is a sign that some are getting antsy about going through with such a bad and unpopular idea, or if this is just a consequence of a long and drawn out fight that establishment pols are not used to having. Regardless, the pressure seems to be getting to Huntersville Mayor Jill Swain. Back on August 28th, Huntersville Commissioner Rob Kidwell sent an email to the entire NC Legislature, outlining some of his concerns regarding the HOT Lanes project. It was polite. It was chock full of numbers. It made some very insightful points. The email closed with the below paragraph. "I am now going to ask the impossible question and I hope that it does not fall on deaf ears. Please consider going back in session, and put a stop to this project until we can develop a true plan to address the traffic concerns of a small area that can and will have an impact state wide. I know that this would be considered quixotic by some, but I urge you to look at all the facts presented. We continue to hear time and time again that “it’s a done deal.” If that was true, then why does the NCDOT and Cintra want to have continued meetings in order to sell this concept and project to elected officials and the voting public?" aShortChronicle and DavidsonNews.net were both copied on this email. No idea why we were copied, or why other media or bloggers were not. Getting these types of emails is pretty common. Frankly, the fact that a single commissioner sent an email to the General Assembly did not seem all that newsworthy, so we did not report on it. Neither did DavidsonNews.net as far as we know. Apparently, Huntersville Mayor Jill Swain did not see it that way. This Monday (over two weeks later!!! ), she sent a long-long email to those same legislators apologizing repeatedly for Commissioner Kidwell actually reaching out to them. Apparently, he didn't follow the "process". Mayor Swain seemed particularly concerned that Commissioner Kidwell actually identified himself as a Huntersville Commissioner. She wanted to make sure it was clear that his request for a special session was not an official request from Huntersville. As one can see from the above email excerpt Commissioner Kidwell uses the word "I", not "the Board" or "Huntersville" when he makes his request. The rest of the email is the same way. He does sign it with "Commissioner", but what elected official wouldn't do that when contacting another elected official. If nothing else, it helps get your message bubbled to the top of the pile. It's very hard to believe anyone - even a busy legislator - would mistake this as an official request from the town and not just a single commissioner. In what has become standard language for members of the HOT Lanes Bucket Brigade, Mayor Swain then goes on to use the word "misinformation" in an offhand manner. (She's learned well from her mentor, Davidson Mayor John Woods, on how to call people liars without actually using the word.) She claims that Commissioner Kidwell's lone email has somehow gotten all of Raleigh up in a swirl. Commissioner Kidwell's one email has taken up all of the NCDOT's time and that's the reason why the public has been getting only a trickle of information from NCDOT regarding the project. They've been too busy responding to legislators' questions from this one email to get out more information to the public and prepare for public hearings in a few weeks. For that, Mayor Swain apologizes for Commissioner Kidwell wasting the Legislators' and NCDOT's time. According to a follow-up email from Commissioner Kidwell on September 8th, only 4 legislators responded to his original email. F.O.U.R. So, you either have to believe dozens of legislators flooded the NCDOT with questions and did not also respond to Commissioner Kidwell, or you have to believe Mayor Swain is just making a lame and desperate attempt to deflect NCDOT's horrible handling of information for this whole project onto one of it's opponents. Davidson Affordable Housing: A Program in Need of Reform. When the Town of Davidson's mandatory affordable housing ordinance comes up in conversation at town hall, it is usually accompanied by numerous self-administered pats on the back and all-knowing head nods by the program's staunch supporters. To hear some people talk, one would think this single program more than just about anything else makes Davidson, well..."Davidson". Those same supporters are quick to its defense if anyone suggests otherwise. there was no waiting list for the mandated for-purchase units in the program, but there was one for rental - a situation the overall program currently does not effectively address. the town had also been dealing with ongoing issues from the county revaluation regarding affordable housing. many houses in the program went unsold and were eligible to people not meeting the income requirements for the population the program is meant to serve. According to data provided to aShortChronicle by the town, this number was as high as 1/3 of the all the units sold through the program. In the Davidson Bay development which is highly praised for its integration of the affordable housing units, only 3 of 7 for-sale affordable units had been purchased by buyers qualified by the Davidson Housing Coalition. Still, in light of all this at that May 2013 meeting, Commissioner Connie Wessner voiced concerns about opening up discussion on the topic. The expectation was that even talking about changes to the program would upset some in town. Commissioner Wessner is now former Commissioner Wessner after last fall's elections. She was the existing program's staunchest supporter on the Town Board. The town has seen its first developer-built affordable housing rental building opened. Ironically, this building is also at Davidson Bay and has a waiting list - solid proof that rental close to transit and in town is in demand. 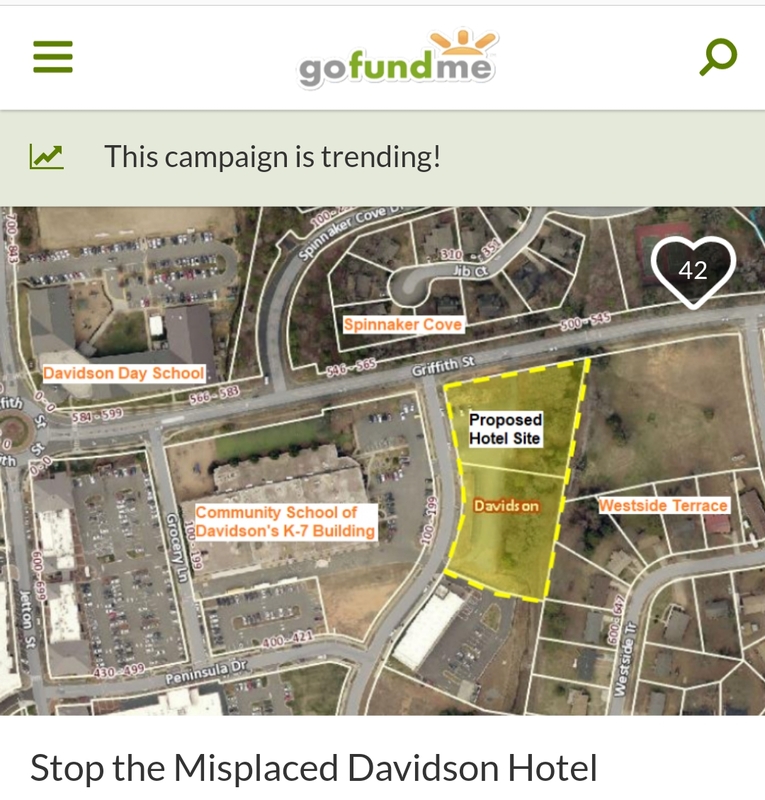 The town is staring down a potential lawsuit over the program in general by Artisan Homes - a Davidson based developer whose very own Jay Johnstone was listed as a participant in the working groups started least year. Still, facing a changed political and economic reality is difficult for some to accept. Planning Board members Brunson Russum and John Kennedy spoke passionately at the September 9th Town Board meeting encouraging the Board to stand strong against potential legal challenges. They followed this up with some rather aggressive comments on DavidsonNews.net. They are part of a core group of affordable housing supporters who appear willing to accept just about any cost to preserve the mandatory aspects of the program. At the other end of the spectrum, there is common sense. At the most recent Board meeting several possible alternatives were discussed that would make the program less rigid. They would provide alternatives the current program does not - making it more user friendly and flexible for developers. Many of the proposed changes would also make the program more attractive to buyers. In short, they would address the program's issues. Here is the link to the presentation. In general, these changes make the program less "mandatory" - for both the developers and the homeowners. As Davidson's Affordable Housing program moves forward, the question is will common sense reforms win the day, or will those who would rather circle the wagons around a failing program prevail? To help a program with a long history of issues, let's hope those who want to actually solve problems win out. Bonus Observation: aShortChronicle has received information that indicates there could eventually be multiple developers involved in future legal action against the Town - a situation that would raise the stakes even further. If this case does eventually go to court, expect it to take the same course as the APFO litigation in recent years which eventually resulted in the Davidson ordinance being repealed. The courts determined that the Adequate Public Facilities Ordinance (APFO) was essentially a tax that the Legislature did not authorize municipalities to implement. The exact same logic could apply to Davidson's Affordable Housing ordinance which is one of only 2 mandatory ordinances in the state. Making the program more voluntary or at least providing more options may be the only way to actually save it. Trying to shame developers into going along with an ordinance that may eventually be determined to be illegal certainly would seem to be a less-good option. In a case with potentially national repercussions, the Towns of Mooresville and Davidson have waded into the fray over municipal broadband network ownership. Mi-Connection was formed without voter approval of the massive debt which now weighs down the operation. For residents of these two towns there can be little doubt that the decision to form Mi-Connection is the most damaging financial decision in their towns' histories. This is particularly true for tiny Davidson where at one point its annual subsidies to the cable company equaled nearly a quarter of the town's annual budget. This damage was caused by a lack of due diligence prior to getting into the business, a poor initial management team that needed to be replaced, and operational decisions that took years to reverse - all examples of exactly why local government should not be involved in a private sector business. These are all examples of exactly why a law like H129 is needed. Mi-Connection is the poster child for the Level Playing Field. These things combined with a brutally competitive industry landscape have resulted in millions of dollars in annual subsidies from the towns. However, in the towns' submissions one gets the impression a large part of the failure of Mi-Connection is actually due to the Level Playing Field law - a law that would not pass until four years after Mi-Connection was formed in 2007 and began wracking up deficits. "Numerous plans that were in the works by various local North Carolina communities to build fiber networks for retail business and residential use ground to a halt with the passage of Section 160A-340 (known as “H129”). The uncertainty caused by the proposed legislation was a major reason a collaborative effort by the towns of Cornelius, Davidson, Huntersville, Mooresville and Troutman and Mecklenburg County ended with 3 of the entities dropping out." Really??? An unpassed law was the reason for these town's dropping out and that's why Mooresville and Davidson were left holding the bag when a risky decision went south? That seems a bit unlikely, so we checked with a couple of elected officials from towns that dropped out who were involved with this decision back in 2007. When asked if the threat of Level Playing Field legislation impacted the decision-making process to join Mi-Connection here's what State Legislator Charles Jeter had to say. "I was a member of the Huntersville Town Board at that time. I was also one of the two Huntersville Commissioners to be assigned to the working group committee of the parties that met often on behalf of the Town of Huntersville. As to your question regarding the level playing field law… I don’t remember it being discussed. In fairness it was some eight years ago and there were a great number of moving parts that were discussed." Cornelius Commissioner David Gilroy was more direct. "Absolutely no role whatsoever. We pulled out because it was stupid in countless ways frankly." So, there you have it. The failure of Mi-Connection lies at the feet of the politicians who supported it and not with some blocking state legislation. Documents obtained by aShortChronicle show that the towns' comments were hardly more than canned copy provided to Mi-Connection by the local government telecom lobbying group SEATOA with instructions to customize the letter as needed. (If you look at the two links above, you will notice that the two documents are identical except for the names of the towns.) It appears the towns did hardly any customization of this lobbyist content and where they did update this copy it was more of an attempt to rewrite the history of Mi-Connection as described above than to provide any real justification for why the Level Playing Field law should be preempted. Making matters worse, it appears the decision to submit these comments to the FCC was not fully discussed by the town Boards before these supporting comments were submitted by staff on the towns behalf. This created a somewhat uncomfortable moment in Davidson when Commissioner Beth Cashion brought the issue up at the town's September 9th monthly meeting expecting to engage in further discussion on the subject only to be told by Town Manager Leamon Brice that the comments had already been submitted - a decision that was clearly made by staff on its own. So, here you have our towns asking for the Federal Government to overturn a state law - a law that has bi-partisan support. They are using canned lobbyist content modified in a way that is factually incorrect. And the effort appears to driven more by staff than our elected officials. Action Opportunity: If you want to submit your own comment to the FCC telling them how bad an idea it is to overturn this type of state law, they are taking comments until September 29th. Here's the link. It's for proceeding 14-115. Correction: Commissioner Cashion brought up this issue at the September monthly meeting for further discussion - not August as was incorrectly reported earlier. Over the past week, aShortChronicle HQ has been moving to new digs and that has taken up any and all time for blogging. However, fear not! We will be back hard at covering shenanigans in local government this week. There has been a good bit happening recently that we've been keeping tabs on, and we should have a couple more pieces coming out this week that will once again have you shaking your head in disbelief. 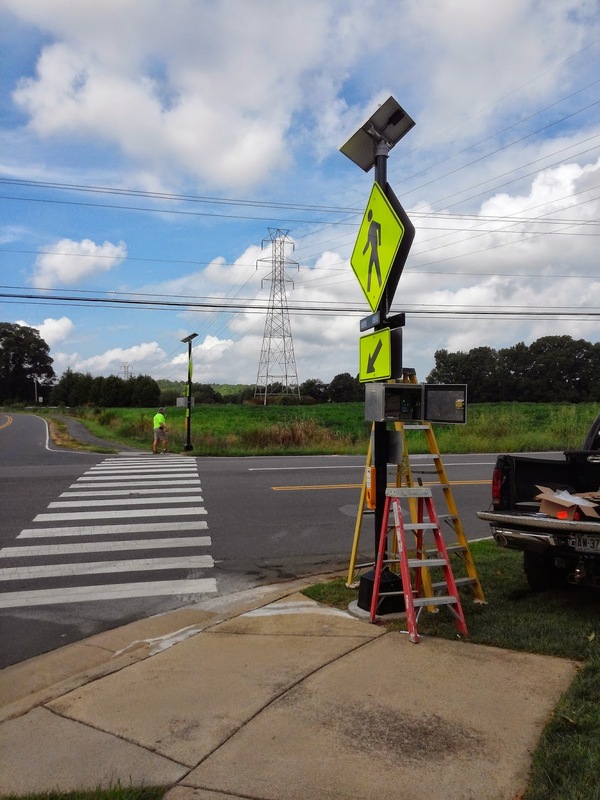 Late last week while the Chiquita Classic was ramping up and bringing a lot of visitors to River Run, contractors were busy installing the long awaited crossing beacons for the crosswalk at Davidson-Concord Rd and Robert Walker Dr. Readers may remember that last year there was a serious accident at this intersection involving a truck and a skateboarder. 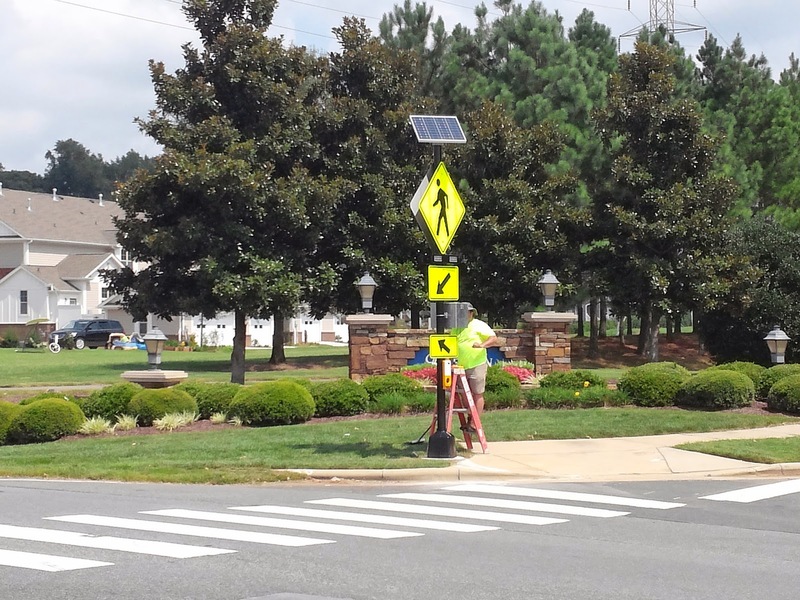 Late last year, the town board approved funding to install the flashing beacons to make the intersection safer. Here at aShortChronicle we spend a lot of time critiquing the things local government does and ponting out where it can do better, but we also like to give credit where credit is due. This is one of those times. These beacons along with Town efforts to get the speed limit lowered on this stretch of road will hopefully pay off and make this area safer for all pedestrians.